The images of galaxies are sorted by date, latest first. 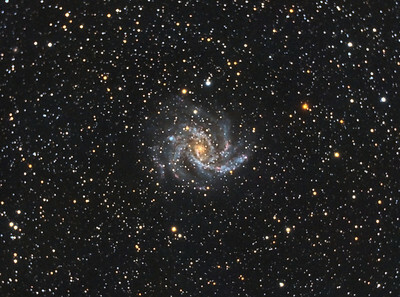 NGC 206. RGB + Luminance. 0.93"/pixel image scale. Astrodon I series Red filter, 18 x 4 minutes, 1x1. 10/12/2018. Astrodon I series Green filter, 18 x 4 minutes, 1x1. 10/12/2018. Astrodon I series Blue filter, 18 x 4 minutes, 1x1. 10/12/2018. Astrodon I series Lum filter, 54 x 4 minutes, 1x1. 10/12/2018. Total 7.2 hours. TEC 140 APO F/7 with TEC Field Flattener, Astro-Physics A-P1100GTO GEM with absolute encoders. QSI660wsg. OAG and Ultrastar autoguider (1.31"/sec), Optec Handy Stepper Motor focuser. Captured and automated with SGP. Calibration and Post-processed with PixInsight. PHD2 settings: RA Aggressiveness: 60, RA Hysteresis: 10, Max RA/Dec Duration: 2000, Min Move: 0.65 (0.85" guide camera), Calibration Steps: 300msec, Auto/Resist Switching, Auto guiding exposure and extreme dithering. M63 Sunflower Galaxy. RGB + Luminance. 0.93"/pixel image scale. Astrodon I series Red filter, 12 x 5 minutes, 1x1. 4/20/2018. Astrodon I series Green filter, 12 x 5 minutes, 1x1. 4/20/2018. Astrodon I series Blue filter, 12 x 5 minutes, 1x1. 4/20/2018. Astrodon I series Lum filter, 36 x 5 minutes, 1x1. 4/20/2018. TEC 140 APO F/7 with TEC Field Flattener, Astro-Physics A-P1100GTO GEM with absolute encoders. QSI660wsg. OAG and Ultrastar autoguider, Optec Handy Stepper Motor focuser. Captured and automated with SGP. Calibration and Post-processed with PixInsight. PHD2 settings: RA Aggressiveness: 60, RA Hysteresis: 10, Max RA/Dec Duration: 2000, Min Move: 0.45, Calibration Steps: 250msec, Auto/Resist Switching, 1-5 sec guiding exposure. 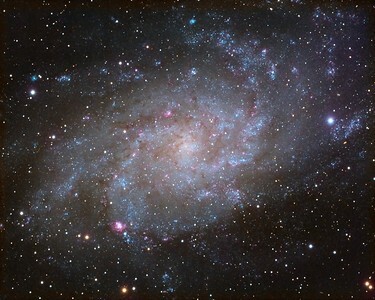 Link to APOD: https://apod.nasa.gov/apod/ap171130.html M33 Triangulum Galaxy. RGB + Luminance. 0.93"/pixel image scale. Astrodon I series Red filter, 12 x 5 minutes, 1x1. 11/17/2017. Astrodon I series Green filter, 12 x 5 minutes, 1x1. 11/17/2017. Astrodon I series Blue filter, 12 x 5 minutes, 1x1. 11/17/2017. Astrodon I series Lum filter, 36 x 5 minutes, 1x1. 11/17/2017. TEC 140 APO F/7 with TEC Field Flattener, Astro-Physics A-P1100GTO GEM. QSI660wsg. OAG and Ultrastar autoguider, Optec Handy Stepper Motor focuser. Captured and automated with SGP. Calibration (including Dark Subtraction) and Post-processed with PixInsight. PHD2 settings: RA Aggressiveness: 60, RA Hysteresis: 10, Max RA/Dec Duration: 2000, Min Move: 0.45, Calibration Steps: 250msec, Auto/Resist Switching, 1 sec guiding exposure. 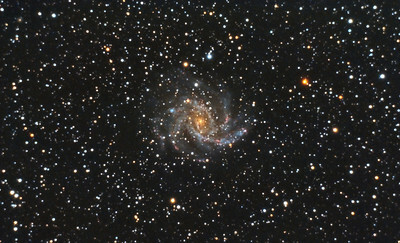 M101 Pinwheel Galaxy. RGB + pseudo-Luminance. 0.93"/pixel image scale. Reason for reddish stars is FWHM on red filter was larger than blue and green filters. Astrodon Red filter, 11 x 7 minutes, 1x1. 5/10/2016. Astrodon Green filter, 11 x 7 minutes, 1x1. 5/10/2016. Astrodon Blue filter, 11 x 7 minutes, 1x1. 5/10/2016. TEC 140 APO F/7 with TEC Field Flattener, Astro-Physics A-P1100GTO GEM. QSI660wsg. OAG and Ultrastar autoguider, Optec Handy Stepper Motor focuser. Captured and automated with SGP. Calibration (including Dark Subtraction) and Post-processed with PixInsight. PHD2 settings: RA Aggressiveness: 60, RA Hysteresis: 10, Max RA/Dec Duration: 2000, Min Move: 0.45, Calibration Steps: 350msec, Auto/Resist Switching, Extreme dithering and Settled at <1.0, 3 sec guiding exposure. NGC7814 Little Sombrero Galaxy. RGB + pseudo-Luminance. 0.93"/pixel image scale. Astrodon Red filter, 14 x 7 minutes, 1x1. 10/11/2015. Astrodon Green filter, 18 x 7 minutes, 1x1. 10/11/2015. Astrodon Blue filter, 18 x 7 minutes, 1x1. 10/11/2015. TEC 140 APO F/7 with TEC Field Flattener, Astro-Physics A-P1100GTO GEM. QSI660wsg. OAG and Ultrastar autoguider, Starlight Instruments PDMS focuser. Captured and automated with SGP. Calibration (including Dark Subtraction) and Post-processed with PixInsight. PHD2 settings: RA Aggressiveness: 60, RA Hysteresis: 10, Max RA/Dec Duration: 2000, Min Move: 0.45, Calibration Steps: 250msec, Auto/Resist Switching, Extreme dithering and Settled at <1.0, 4.5 sec guiding exposure. NGC7331 Deer Lick and Stephan's Quintet. RGB + pseudo-Luminance. 0.96"/pixel image scale. Astrodon Red filter, 18 x 7 minutes, 1x1. 9/19/2015. Astrodon Green filter, 18 x 7 minutes, 1x1. 9/19/2015. Astrodon Blue filter, 18 x 7 minutes, 1x1. 9/19/2015. TEC 140 APO F/7 with Astro-Physics A-P1100GTO GEM. QSI660wsg. OAG and Ultrastar autoguider, Optec Handy Stepper Motor focuser. Captured and automated with SGP. Calibration (including Dark Subtraction) and Post-processed with PixInsight. PHD2 settings: RA Aggressiveness: 60, RA Hysteresis: 10, Max RA/Dec Duration: 2000, Min Move: 0.45, Calibration Steps: 350msec, Auto/Resist Switching, Extreme dithering and Settled at <1.0, 3.5 sec guiding exposure. 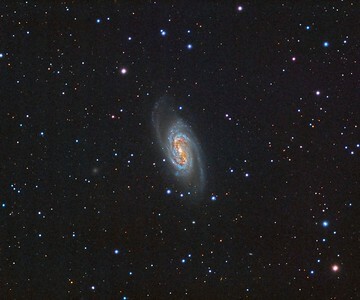 NGC2903 Galaxy. Pseudo-LRGB. 0.96"/pixel image scale. Astrodon Red filter, 8 x 7 minutes, 1x1. 2/14/2015. Astrodon Green filter, 18 x 7 minutes, 1x1. 2/14/2015. Astrodon Blue filter, 18 x 7 minutes, 1x1. 2/14/2015. Pseudo-Luminance from RGB. TEC 140 APO F/7 with Astro-Physics A-P1100GTO GEM. QSI660wsg. Guided with QSI OAG and Superstar, Optec Handy Stepper Motor focuser. Captured and automated with SGP. Calibration and Post-processed with PixInsight. PHD2 settings: RA Aggressiveness: 60, RA Hysteresis: 10, Max RA/Dec Duration: 1000, Min Move: 0.60 pixel, Search Region: 50 pixels, Calibration Steps: 125msec, Auto/Resist Switching, Very High dithering and Settle at < 1.0 for 8 seconds, 5 sec guiding exposure. 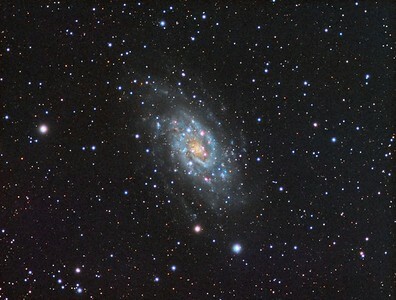 NGC2403 Galaxy. Pseudo-LRGB. 0.96"/pixel image scale. Astrodon Red filter, 13 x 10 minutes, 1x1. 1/24/2015. Astrodon Green filter, 13 x 10 minutes, 1x1. 1/24/2015. Astrodon Blue filter, 13 x 10 minutes, 1x1. 1/24/2015. Pseudo-Luminance from RGB. TEC 140 APO F/7 with Astro-Physics A-P1100GTO GEM. QSI660wsg. Guided with A-P Vario Finder 250mm focal length and Superstar, Optec Handy Stepper Motor focuser. Captured and automated with SGP. Calibration and Post-processed with PixInsight. PHD2 settings: RA Aggressiveness: 90, RA Hysteresis: 10, Max RA/Dec Duration: 1000, Min Move: 0.25, Calibration Steps: 550msec, Auto/Resist Switching, Extreme dithering and Settle at < 1.0, 3 sec guiding exposure. 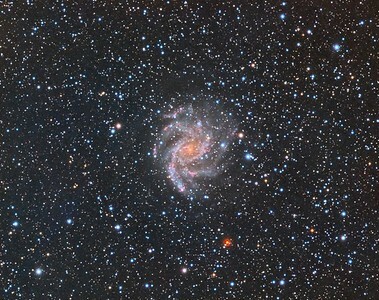 NGC6946: Fireworks Galaxy. RGB. 0.96"/pixel image scale. Astrodon Red filter, 10 x 10 minutes, 1x1. 8/15/2014. Astrodon Green filter, 10 x 10 minutes, 1x1. 8/15/2014. Astrodon Blue filter, 10 x 10 minutes, 1x1. 8/15/2014. TEC 140 APO F/7 with Astro-Physics A-P1100GTO GEM. QSI660wsg. Guided with A-P Vario Finder 250mm focal length and Superstar, Optec Handy Stepper Motor focuser. Captured and automated with SGP. Calibration (including Dark Subtraction) and Post-processed with PixInsight. PHD2 settings: RA Aggressiveness: 60, RA Hysteresis: 10, Max RA/Dec Duration: 1000, Min Motion: 0.10, Calibration Steps: 550msec, Auto/Resist Switching, Extreme dithering and Settle at < 0.4, 1 sec guiding exposure. 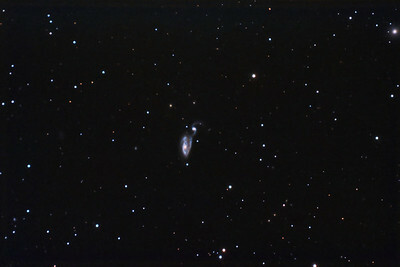 M82: Cigar Galaxy in Ursa Major. HaRGB. No Luminance added. 0.46"/pixel image scale. Astrodon 5nm Ha filter, 13 x 30 minutes, Unbinned 1x1. F/10, 2/17/2013. Astrodon Red filter, 24 x 5 minutes, Unbinned 1x1. F/10, 3/9/2013. Astrodon Green filter, 24 x 5 minutes, Unbinned 1x1. F/10, 3/9/2013. Astrodon Blue filter, 27 x 5 minutes, Unbinned 1x1. F/10, 3/9/2013. Celestron 8" EdgeHD with Astro-Physics Mach1GTO GEM. Atik 460EX mono. Hutech OAG. Lodestar. Captured with Nebulosity. Processed with PixInsight. PHD settings: RA Aggressiveness: 60, RA Hysteresis: 10, Max Dec Duration: 75, Min Motion: 0.70, Calibration Steps: 125msec, Auto/Resist Switching, Extreme dithering and Settled at < 0.5, 3 sec guiding exposure. M82: Cigar Galaxy in Ursa Major. LHaRGB. 0.46"/pixel image scale. Reprocessed using calibration with PixInsight. Astrodon Luminance filter, 87 x 5 minutes, Unbinned 1x1. F/10, 2/15/2013. Astrodon 5nm Ha filter, 13 x 30 minutes, Unbinned 1x1. F/10, 2/17/2013. Astrodon Red filter, 24 x 5 minutes, Unbinned 1x1. F/10, 3/9/2013. Astrodon Green filter, 24 x 5 minutes, Unbinned 1x1. F/10, 3/9/2013. Astrodon Blue filter, 27 x 5 minutes, Unbinned 1x1. F/10, 3/9/2013. Celestron 8" EdgeHD with Astro-Physics Mach1GTO GEM. Atik 460EX mono. Hutech OAG. Lodestar. Captured with Nebulosity. Processed with PixInsight. PHD settings: RA Aggressiveness: 60, RA Hysteresis: 10, Max Dec Duration: 75, Min Motion: 0.70, Calibration Steps: 125msec, Auto/Resist Switching, Extreme dithering and Settled at < 0.5, 3 sec guiding exposure. 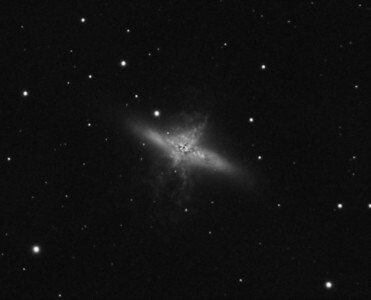 M82: Cigar Galaxy in Ursa Major, Astrodon 5nm Ha filter, 13 x 30 minutes, Unbinned 1x1. F/10, 2/17/2013. Celestron 8" EdgeHD with Astro-Physics Mach1GTO GEM. Atik 460EX mono. Hutech OAG. Lodestar. Captured and pre-processed with Nebulosity. Stacked and processed with PixInsight. PHD settings: RA Aggressiveness: 60, RA Hysteresis: 10, Max Dec Duration: 75, Min Motion: 0.70, Calibration Steps: 125msec, Auto/Resist Switching, Extreme dithering and Settled at < 0.5, 3 sec guiding exposure. M82: Cigar Galaxy in Ursa Major, Astrodon Luminance filter, 87 x 5 minutes, Unbinned 1x1. F/10, 2/15/2013. Celestron 8" EdgeHD with Astro-Physics Mach1GTO GEM. Atik 460EX mono. Hutech OAG. Lodestar. Captured and pre-processed with Nebulosity. Stacked and processed with PixInsight. PHD settings: RA Aggressiveness: 60, RA Hysteresis: 10, Max Dec Duration: 75, Min Motion: 0.70, Calibration Steps: 125msec, Auto/Resist Switching, Extreme dithering and Settled at < 0.5, 3 sec guiding exposure. 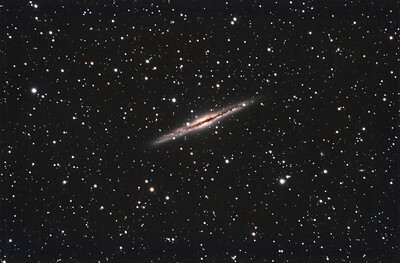 NGC6384, Spiral Galaxy in Ophiuchus. 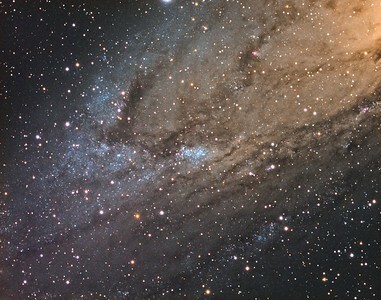 24 x 10 minutes, F/10, 6/10/2012. Seeing was not good.Celestron 8" EdgeHD with Astro-Physics Mach1GTO GEM. SXVR-M25C. Hutech OAG. Lodestar. Capture and pre-processed (BPM, Bias, Flats Calibration) with Nebulosity. DeBayered, stacked and post-processed with PixInsight. PHD settings: RA Aggressiveness: 60, RA Hysteresis: 10, Max Dec Duration: 75, Min Motion: 0.50, Calibration Steps: 100msec, Auto/Resist Switching, Extreme dithering and Settled at < 0.5, 3 sec guiding exposure. 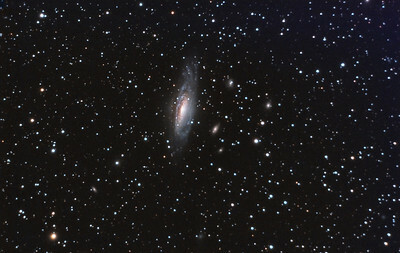 NGC6384, Spiral Galaxy in Ophiuchus. 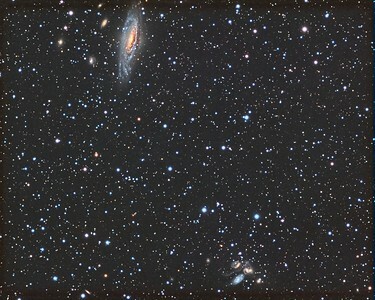 24 x 10 minutes, F/10, 6/10/2012. Seeing was not good. Celestron 8" EdgeHD with Astro-Physics Mach1GTO GEM. SXVR-M25C. Hutech OAG. Lodestar. Capture and pre-processed (BPM, Bias, Flats Calibration) with Nebulosity. DeBayered, stacked and post-processed with PixInsight. PHD settings: RA Aggressiveness: 60, RA Hysteresis: 10, Max Dec Duration: 75, Min Motion: 0.50, Calibration Steps: 100msec, Auto/Resist Switching, Extreme dithering and Settled at < 0.5, 3 sec guiding exposure. 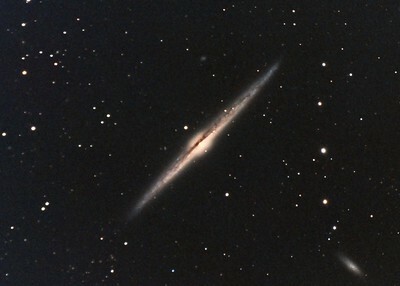 NGC4565: Needle Galaxy in Coma Bernice, 20 x 10 minutes, F/10, 5/19/2012. Celestron 8" EdgeHD with Astro-Physics Mach1GTO GEM. SXVR-M25C. Hutech OAG. Lodestar. Complete processing with PixInsight including dark subtraction. PHD settings: RA Aggressiveness: 60, RA Hysteresis: 10, Max Dec Duration: 75, Min Motion: 0.50, Calibration Steps: 100msec, Auto/Resist Switching, Extreme dithering and Settled at < 0.5, 3 sec guiding exposure. 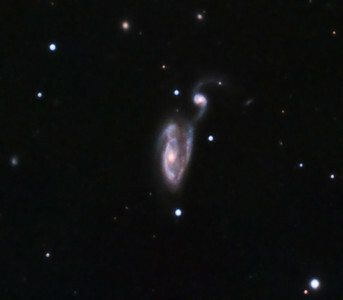 NGC5395/94 Arp 84 in Canes Venatici, 33 x 10 minutes, F/10, 5/12/2012. Celestron 8" EdgeHD with Astro-Physics Mach1GTO GEM. SXVR-M25C. IDAS LPS Filter. Hutech OAG. Lodestar. Capture and pre-processed (BPM, Bias, Flats Calibration) with Nebulosity. DeBayered, stacked and post-processed with PixInsight. PHD settings: RA Aggressiveness: 60, RA Hysteresis: 10, Max Dec Duration: 75, Min Motion: 0.50, Calibration Steps: 100 msec, Auto/Resist Switching, Extreme dithering and Settled at < 0.5, 3 sec guiding exposure. 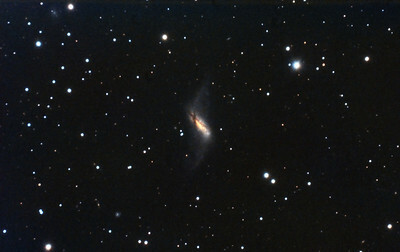 NGC5395/94 Arp 84 in Canes Venatici, Uncropped, 33 x 10 minutes, F/10, 5/12/2012. Celestron 8" EdgeHD with Astro-Physics Mach1GTO GEM. SXVR-M25C. IDAS LPS Filter. Hutech OAG. Lodestar. Capture and pre-processed (BPM, Bias, Flats Calibration) with Nebulosity. DeBayered, stacked and post-processed with PixInsight. PHD settings: RA Aggressiveness: 60, RA Hysteresis: 10, Max Dec Duration: 75, Min Motion: 0.50, Calibration Steps: 100 msec, Auto/Resist Switching, Extreme dithering and Settled at < 0.5, 3 sec guiding exposure. M64: Black Eye Galaxy in Coma Bernice, 32 x 10 minutes, F/10, 4/21/2012 and 5/11/2012. Celestron 8" EdgeHD with Astro-Physics Mach1GTO GEM. SXVR-M25C. IDAS LPS Filter. Hutech OAG. Lodestar. Capture and pre-processed (BPM, Bias, Flats Calibration) with Nebulosity. DeBayered, stacked and post-processed with PixInsight. PHD settings: RA Aggressiveness: 60, RA Hysteresis: 10, Max Dec Duration: 75, Min Motion: 0.50, Calibration Steps: 100 msec, Auto/Resist Switching, Extreme dithering and Settled at < 0.5, 3 sec guiding exposure. 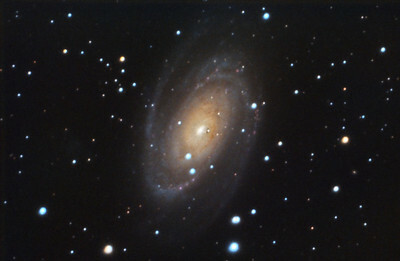 M81: Bode Galaxy in Ursa Major, 26 x 10 minutes, F/10, 2/24/2012. It was a very windy night averaging 13MPH with 20MPH gust!!!! Celestron 8" EdgeHD with Astro-Physics Mach1GTO GEM. SXVR-M25C. IDAS LPS Filter. Hutech OAG. Lodestar. Pre-Processed (BPM, Bias, Flats Calibration and Debayer) with Nebulosity. Post-processed with PixInsight. PHD settings: RA Aggressiveness: 90, RA Hysteresis: 10, Max Dec Duration: 50, Min Motion: 0.30, Calibration Steps: 100msec, Auto/Resist Switching, No Dithering, 5 sec guiding exposure. 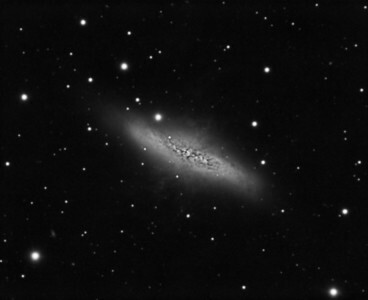 NGC660: Polar Ring Galaxy in Pisces, 34 x 10 minutes, F/10, 12/17/2011. Celestron 8" EdgeHD with Astro-Physics Mach1GTO GEM. SXVR-M25C. IDAS LPS Filter. Hutech OAG. Lodestar. Pre-Processed (BPM, Bias, Flats Calibration and Debayer) with Nebulosity. Post-processed with PixInsight. PHD settings: RA Aggressiveness: 90, RA Hysteresis: 10, Max Dec Duration: 50, Min Motion: 0.30, Calibration Steps: 100msec, Auto/Resist Switching, No Dithering, 0.5 sec guiding exposure. 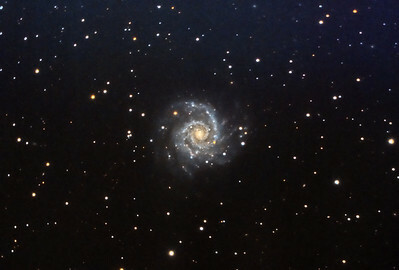 M77: Barred Spiral Galaxy in Cetus, 36 x 10 minutes, F/10, 10/29/2011. Celestron 8" EdgeHD with Astro-Physics Mach1GTO GEM. SXVR-M25C. IDAS LPS Filter. Hutech OAG. Lodestar. Pre-Processed (BPM, Bias, Flats Calibration and Debayer) with Nebulosity. Stacked with Deep Sky Stacker. Post-processed with PixInsight. PHD settings: RA Aggressiveness: 70, RA Hysteresis: 10, Max Dec Duration: 100, Min Motion: 0.50, Calibration Steps: 125msec, Auto/Resist Switching, No Dithering, 3 sec guiding exposure. 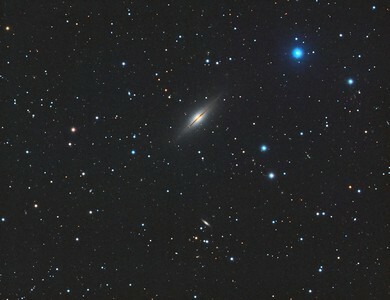 NGC891: Galaxy in Andromeda, 42 x 10 minutes, F/10, 10/28/2011. Celestron 8" EdgeHD with Astro-Physics Mach1GTO GEM. SXVR-M25C. IDAS LPS Filter. Hutech OAG. Lodestar. Pre-Processed (BPM, Bias, Flats Calibration and Debayer) with Nebulosity. Stacked and Post-processed with PixInsight. PHD settings: RA Aggressiveness: 70, RA Hysteresis: 10, Max Dec Duration: 100, Min Motion: 0.60, Calibration Steps: 175msec, Auto/Resist Switching, Dithering: Extreme and Settle < 0.5, 1.0 - 1.5 sec guiding exposure. 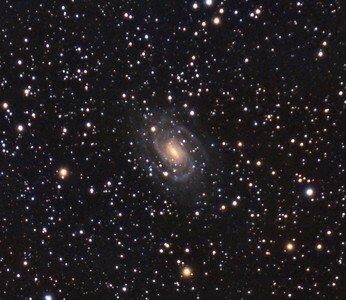 NGC6946, Firecracker Galaxy. 7/2/2011. CPC0800 F/10. Mitty Wedge. SXVR-M25C. IDAS LPS Filter. Hutech OAG. Lodestar. 29 x 10 minutes. Total 290 minutes. Pre-Processed (BPM, Bias, Flats Calibration and Debayer) with Nebulosity. Stacked and Post-processed with PixInsight. PHD settings: RA Aggressiveness: 90, RA Hysteresis: 10, RA Max Duration: 600, Dec Max Duration: 700, Min Motion: 1.00, Calibration Steps: 500msec, Auto/Resist Switching, Dithering: Extreme and Settle < 0.5, 1.0 sec guiding exposure. 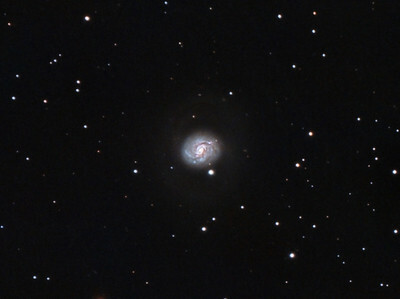 NGC6946, Firecracker Galaxy. 7/1/2011. CPC0800 F/6.3 focal reducer. Mitty Wedge. SXVR-M25C. IDAS LPS Filter. Hutech OAG. Lodestar. 30 x 10 minutes. Total 300 minutes. Pre-Processed (BPM, Bias, Flats Calibration and Debayer) with Nebulosity. Stacked and Post-processed with PixInsight. PHD settings: RA Aggressiveness: 90, RA Hysteresis: 10, RA Max Duration: 600, Dec Max Duration: 600, Min Motion: 0.60, Calibration Steps: 500msec, Auto/Resist Switching, Dithering: Extreme and Settle < 0.5, 0.2 sec guiding exposure. 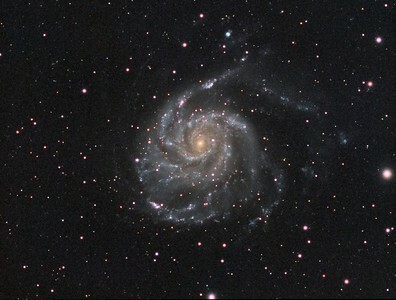 Spiral Galaxy, M101. 5/29/2011. CPC0800 F/6.3. Mitty Wedge. SXVR-M25C. IDAS LPS Filter. Hutech OAG. Lodestar. 5 x 10 minutes. Total 50 minutes. Processed with PixInSight. Clouds appeared earlier than expected. Flats were not taken or applied. 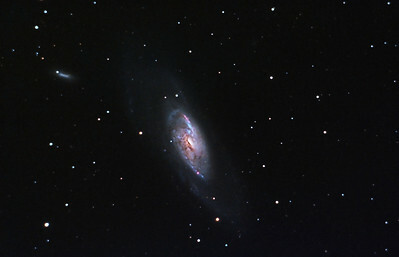 Spiral Galaxy, M106. 5/4/2011. CPC0800 F/10. Mitty Wedge. SXVR-M25C. IDAS LPS Filter. Hutech OAG. Lodestar. 26 x 10 minutes. Total 260 minutes. Processed with PixInSight. 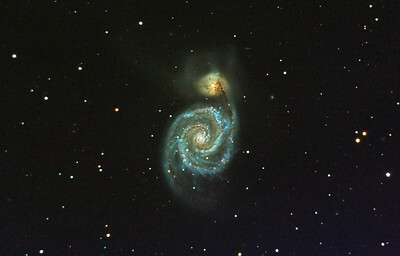 Whirlpool Galaxy, M51. 4/30/2011. CPC0800 F/10. Mitty Wedge. SXVR-M25C. IDAS LPS Filter. Hutech OAG. Lodestar. 36 x 10 minutes. Total 360 minutes. Processed with PixInSight. 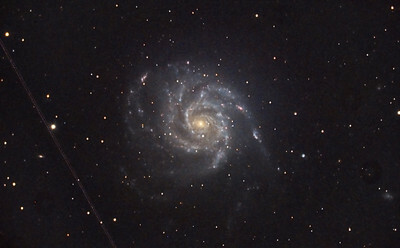 Spiral Galaxy, M74. 11/12/2010. CPC0800 F/6.3 focal reducer. Mitty Wedge. SXVR-M25C. IDAS LPS Filter. Hutech OAG. Lodestar. 21 x 10 minutes. Total 210 minutes. Processed with PixInSight. 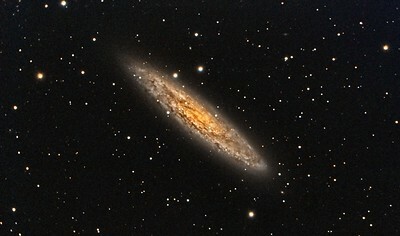 Silver Coin Galaxy, NGC253. 9/10/2010 and 9/11/2010. CPC0800 F/6.3 focal reducer. Mitty Wedge. SXVR-M25C. IDAS LPS Filter. Hutech OAG. Lodestar. 26 x 10 minutes. Total 260 minutes. Processed with PixInSight. 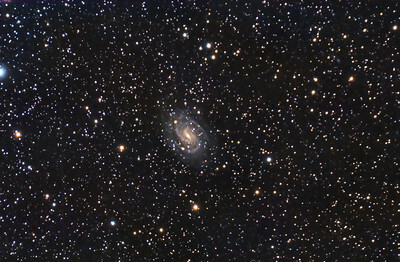 Galaxy, NGC7331. 9/3/2010 and 9/4/2010. CPC0800 F/10. Mitty Wedge. SXVR-M25C. IDAS LPS Filter. Hutech OAG. Lodestar. 26 x 15 minutes and 6 x 30 minutes. Total 570 minutes. Processed with PixInSight. M82: Cigar Galaxy in Ursa Major. HaRGB. No Luminance added. 0.46"/pixel image scale. Astrodon 5nm Ha filter, 13 x 30 minutes, Unbinned 1x1. F/10, 2/17/2013. Astrodon Red filter, 24 x 5 minutes, Unbinned 1x1. F/10, 3/9/2013. Astrodon Green filter, 24 x 5 minutes, Unbinned 1x1. F/10, 3/9/2013. Astrodon Blue filter, 27 x 5 minutes, Unbinned 1x1. F/10, 3/9/2013. Celestron 8" EdgeHD with Astro-Physics Mach1GTO GEM. Atik 460EX mono. Hutech OAG. Lodestar. Captured with Nebulosity. Processed with PixInsight. PHD settings: RA Aggressiveness: 60, RA Hysteresis: 10, Max Dec Duration: 75, Min Motion: 0.70, Calibration Steps: 125msec, Auto/Resist Switching, Extreme dithering and Settled at < 0.5, 3 sec guiding exposure.